Headline reads: Tony Kanaan tells teammate Danica Patrick to improve her attitude. Please Kanaan make fun of her helmet hair, tell her that neon green racing onesie makes her look fat too. Didn’t you learn anything from Hitch? As if the future of Nascar weren’t already riding on her upcoming photo shoots and Sports Illustrated swimsuit spread… During these tough times of oil spills, Indy fans have become cruel and unforgiving – can you blame for demanding more than starting at 23rd for the big race? Next thing you know she’ll be waist deep in cans of Bud Light, thumbing a ride to the next Nascar venue. 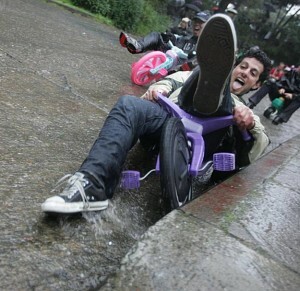 Or drifting to San Francisco to take up Big Wheel Racing. Somehow zooming down asphalt on a 3-year-old’s plastic crotch rocket doesn’t quite hit it home like Yankee baseball or Jamaican bobsledding, but I get it. They’re way more reliable than scooters. I remember my RA in college had a Razor scooter…and if you saw him you would absolutely know why walking may have been an issue. When he wasn’t creeping outside the girls bathroom, we’d see him wheeling and dealing through campus, simply plowing through crowds. Recklessly powered by shear body mass and ez-glide wheels. Big Wheels could have saved lives. Average Joe, move over before Average Armstrong and Downhill Danica run you over. This skittermark sport has staked its claim after a decade of officially unofficial Big Wheel racing, and once there’s an eco-friendly government backing on it the sponsorships will be rolling in. Since Transformers 3 dropped Megan Fox, the cult will be able to scoop her up for promos and tours. Not sure how one goes about tailgating for such an event. I can imagine it involves trading POGS and enjoying finger foods like peanut butter & banana sangwiches. Andretti, Patrick, Kanaan, Franchetti, Dixon…there’s a lot at stake this Sunday when they fire that starting gun at Indy.